Wash and scrub potatoes, especially if you’re leaving the skin on. Which is recommended. Cut the potatoes into even sticks. Add the potatoes into a bowl and cover with cold water. Soak for at least 30 minutes but as ong as overnight. 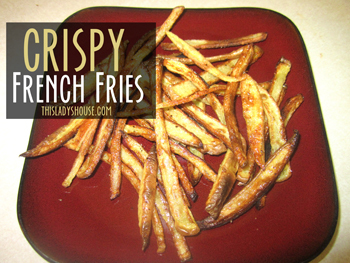 Drain and rinse the fries and lay them on a paper towel lined cooling rack to dry. Blot the tops with additiona paper towels to grap any excess moisture. Line a baking pan with parchment paper and evenly coat that with 2 tablespoons of oil. Add the potatoes to large bowl, add an additional 1-2 tablespoons of oil and a little sea salt and pepper. Toss around to mix. Evenly line the baking pan with the fries in a single layer. Don’t overlap or they fries won’t cook properly. Bake at 475ºF for approximately 35 minutes, tossing around once or twice at around 15 minutes of cooking. Remove from the oven when they are brown and crispy to your liking. Serve immediately with your favorite seasonings and your favorite dipping sauce! This entry was posted in Recipe and tagged Side dish, Snacks.